I don’t usually make a big deal out of Valentine’s Day because I don’t think you should need a holiday to do something nice for your sweetie or spend time together. Flowers and chocolate are always lovely to receive, whether from the swanky specialty shop or from the supermarket, but are even better when they are gifted “just because”. I like to pick out (or hint at) Valentine’s Day gifts that feel a little luxurious. This year my picks lend themselves to a relaxing night in – perhaps because staying in is less stressful than going out with a new baby. 1. As much as I love a dark nail color in the winter months, this light pink is classically feminine and pretty for a well manicured look since chips are less obvious. Would you expect any less from a Ciate collection that is a collaboration with Olivia Palermo? 2. Jo Malone became a household name when it was reported that Kate Middleton placed these candles in the bathrooms at her wedding. I’m a fan of anything in the Peony & Blush Suede collection. 3. These Sorrel boots are on the practical side of my gift list, but made the cut after realizing that my beloved metallic Hunter boots are not really snow-ready. 4. What glamour girl doesn’t love jewelry? The Aria cuff by Stella & Dot is bold yet versatile due to the crackled quartz and gold color palette. 5. Nothing screams luxury more than silk pajamas. These even come in box that’s just beautiful! 6. Remember the royal blue satin pumps that every bride wished for thanks to Carrie Bradshaw? The classic Manolo Blahnik Hangisi Jeweled pump is now available in this shimmering neutral hue. 7. A wool or cashmere throw is perfect for cuddling up under with your sweetie to watch a good old Romantic Comedy, or by yourself to watch Breakfast at Tiffany’s for the umpteenth time (champagne and sparkly earrings also recommended). 8. Would I buy a wine because the instagram account is so good? Maybe, but it helps that the wine is good too! 9. It’s possible that I’ve been watching too much Scandal lately to get caught up before the new episode this week, but I can’t stop thinking about how cozy Olivia Pope always looks in her oversized cashmere cardigans sipping red wine and noshing on popcorn. This cream cashmere robe is both indulgent and budget-friendly. When it comes to Valentine’s Day, I certainly don’t say no to flowers and chocolate, but prefer a feminine gift that makes me feel flirty and pretty. 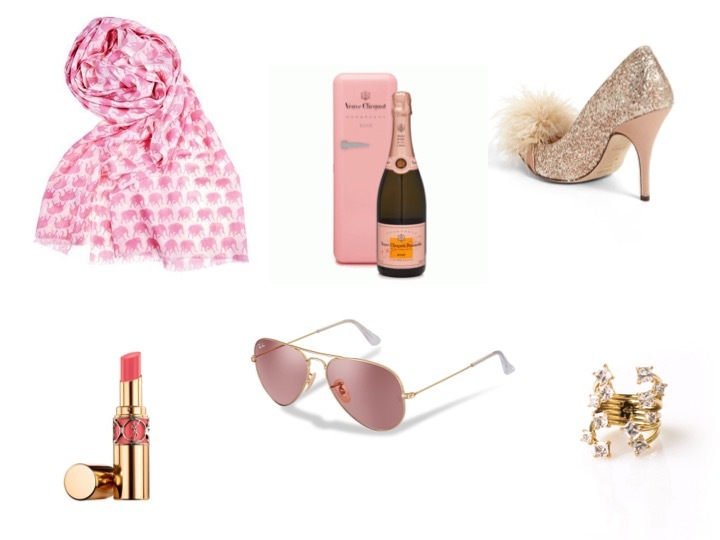 Something sparkly, whether shoes, jewelry, or sparkling wine, always does the trick, but I’ve rounded up a few more practical gift ideas as well. This Julie Vos “Babar” shawl is oh-so-cute and warm for the remaining winter days and let’s not forget to wear sunglasses, even in the winter. Every girl knows that a quick swipe of a favorite lipstick instantly lifts her spirits. What are you getting your valentine? I’m guessing mine would love nothing more than a good old-fashioned love note (maybe tucked into a new wallet or tie box).